The wave of bank failures and real estate crisis has crippled growth in the nation’s leading growth market. Put over 100,000 Georgians back to work. Create the equivalent of 15 Piedmont Parks within the I-285 Perimeter. Remove over 22,000 acres of non-performing real estate from outside the Perimeter. Inject liquidity into the Southeast US banking system to fuel residential and small business economic development. A green tree canopy exists in most of Atlanta’s backyards, yet only 4.6 percent of land within the city limits is preserved as parks. Atlanta Teaser from Red Fields to Green Fields on Vimeo. RFTGF - Atlanta from Red Fields to Green Fields on Vimeo. 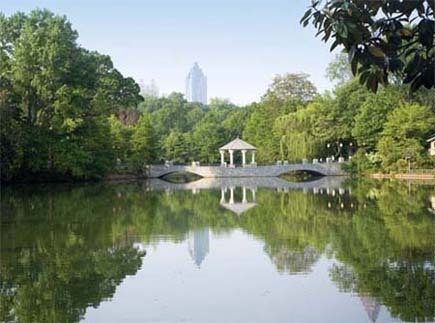 Researchers at the Georgia Institute of Technology conducted the initial “case study” to demonstrate the potential for creating parks and green space in the current real estate market. Metropolitan Atlanta was the focus. Georgia leads the nation in bank failures, and Atlanta is one of the most overbuilt real estate markets in the country. The Atlanta region has 24 million square feet of vacant office space and has vacant lots selling for 25 cents on the dollar. The metropolitan region could gain 6,000 acres of park space and 780 miles of trails by acquiring selected properties. The parks initiative could generate $20 billion in economic development, 175,000 temporary construction jobs and 100,000 permanent jobs. These transformative effects could be realized at costs well below the trillions now being invested in programs that backstop the banks strapped with poor real estate assets. Today, similar studies are underway for five other metropolitan areas: Cleveland, Miami-Dade, Philadelphia, Denver and Wilmington. The research involves local organizations and universities, coordinated through the Georgia Institute of Technology. This national Redfields to Greenfields study is called R2G-USA.